Located in a Gothic palazzo on the Grand Canal, the Ca’ Rezzonico is a public museum and art gallery dedicated to 18th century Venice, offering a varied and interesting collection of antique furniture and paintings. 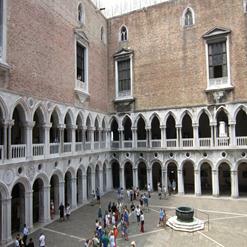 It opened as a public museum in 1936 and is now regarded as one of the finest museums in Venice, mainly because of its unique character, where the objects designed for great palazzo are displayed in a palazzo. The museum is adorned with magnificent paintings of some of the great artists of Venice including Francesco Guardi, G. B. Tiepolo, Pietro Longhi, Visconti, Crosato and Canaletto.